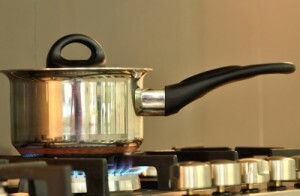 Did you know that the top of your stove can be lifted for cleaning? (One exception is those smooth topped stoves.) You lift the whole top piece just like you would the hood of a car. You will should find a metal rod that you can pull up and fit into the top to secure it. Use a spatula to scrape up anything chunky. Wipe off the surfaces using Dawn dish washing detergent. It cuts the grease fairly well. Use an SOS pad to remove baked on grease. If you don’t get it all the first time, don’t worry. Clean out what you can and try again next time.